Crytek, developer of Ryse and shooters traditionally incorporating the word "Cry" in the title have launched pre-registration for The Collectables, its first free-to-play mobile action game incorporating CryEngine tech. Anyone want a special pre-reg goodie code? The Collectables, powered by Mobage...wait, come back. It actually looks rather cool! Look at all of those explosions, and are those collectible cards? Who doesn't love collectible cards? 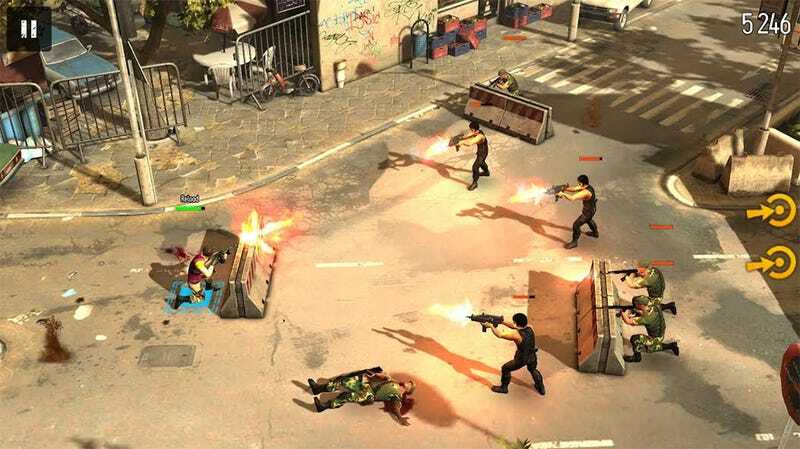 The game, as the title suggests, involves collecting gear and characters, forming a squad, and blowing the hell out of everything that moves. To be honest, I always worry a little bit when it comes to Mobage-powered games with collectible components — can't help but feel a little pressured towards buying all the things — but this one has incredibly tight visuals, so I'm willing to give it a go. Pre-registration for both the Android and iOS versions of The Collectables isnow open at the game's official website, with folks who sign up securing a special character and weapon when the game launches. And, because nothing says stealthy killers like pink-and-yellow, entering in the referral code 'Kotaku' grants players a Tommy gun and this lovely bit of work.